Yep, I entered another contest and you can too! I am bound to win something one of these days lol. 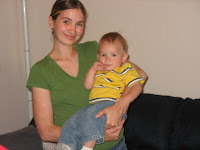 Adventures in Babywearing is having another giveaway, this time for a Moby Wrap from SuperMomz. I'd really love a new carrier to use when I have Little Baby here and not enough hands lol. And check out Adventures in Babywearing to see how you can get 10% off all orders at SuperMomz through July. I did much better this week than I did the last two weeks. There are still a few that I didn't do so hot on this week. Like laundry, although I got it washed, it is sitting in piles in my room waiting to be folded and put away. I haven't been cleaning much and only flossed once this week. I'm doing better at my nighttime routine stuff for me and Toddler, and still doing pretty good for prayers and bringing dishes to the kitchen. I am doing great with reading scriptures every day, having one straight hour off the computer when Hubby is home, and making dinner 3x a week. Since I'm still trying to work on so many goals I'm not going to add another today, but I will next week since it's a new month. 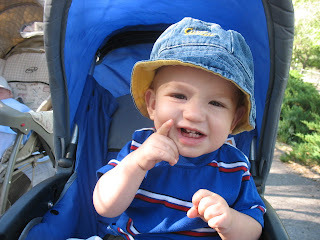 * Toddler keeps telling me his teeth hurt, guess it's about time for his first dentist appointment. Oh and I have a toothache and am due for a cleaning too. * My family was going to come get Toddler and take him for a week, but then cancelled cuz they can't afford the gas. I was starting to look forward to a little break. * I hate this heat, and that we don't have central a/c, just one window unit upstairs that does not cool the whole house. OK, that's better :) Now I need to go do something productive to get me out of this slump. How many pieces of jewelry do you wear most days? What is your favorite instrumental song? Who has a last name that you like? - Now that's a silly question lol. I like my last name. I don't have a preference for names as long as they are easy to pronounce and spell. Name a popular movie you’ve never seen. - Braveheart, Pulp Fiction, Pirates 3. There's a few. Fill in the blank: Nothing makes me ___________ like ____________. - Nothing makes me relaxed like a professional massage. Today I am blessing you with a bunch of links to posts I have enjoyed over the last few weeks. I want to try doing this every week, but we'll see how often I really remember lol. So check them out and enjoy! Antique Mommy teaching her boy how to eat healthy. The post that has had me giggling for weeks, every time I think of it, by Dawn. I don't think I'll ever look at pepper the same way again. And laugh at these t-shirts while you're there. How to make your home your sanctuary, by who other than Home Sanctuary. Every mommy will appreciate the sentiment expressed by Notes from the Trenches in her post about her boy growing up. Jen shares with us computer art at it's finest and funniest with this hilarious video she found. 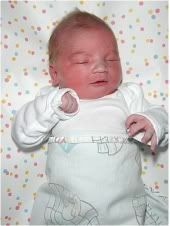 Go congratulate Beth on the birth of her cute little boy. Organizing Junkie helps you learn how to get organized with simple steps. Go laugh with Michelle and her funny pictures post. Where does all that hamburger come from? Ponder that with Simply Chumly. Not everyone is perfect, but Mist is working on it. Today I am thankful that I went to the doctor on Monday and was able to get some antibiotics and my throat feels soooo much better! Hurray for modern medicine! Now I just need to catch up on my last few days of slacking in the housework department lol. I'm thankful Little Baby is taking a nap right now, cuz I just realized we haven't eaten lunch yet, better go get some! The next giveaway at 5 Minutes for Mom is a very cool Bling MetroWrap™ by MetroMamma™. This is a stylish, cool baby carrier that is easy to use anywhere. I would love one, when I have Little Baby it is hard to go anywhere with 3 kids under 3, so I like to have him in a carrier to make it easier. I've wanted to try a wrap, but haven't had the money to spend for a nice one. And these come in the coolest designs! Like the one shown here with a peace sign. There's also a pirate sign, crown, or dragon, all done in cool sparkly designs. So if you want a chance to win one, go to 5M4M now! I don't know about the rest of you, but I get a ton of email spam! I delete about 50 spam messages a day, it's such a pain. Sometimes I want to just switch my email, use my yahoo or gmail more, but I use my hotmail for everything, I wouldn't even know where to start in switching stuff over. Only messages from my contacts go to my Inbox, everything else goes straight to the junk folder, but I still have to go through it for stuff I do want that gets sent there from non-contacts. Stupid spammers. I don't care about "Save up to 51% on your student loans!" or "Get rich at home with Google!" and especially don't care for "U caN Plez yuR GirL tonItE!!" ugh. All those "You qualify for this free offer.." and "Here's your $100 giftcard!" would make me a rich woman if they were actually real. I get "FREE 2 day vacation!" at least twice a day. If those were real I'd be on vacation all the time! Why do people send spam? Just for kicks and giggles? I don't see what profit they get from bogging down my inbox with junk. I'm surprised at myself for actually cleaning the bathrooms this morning lol. I need to do dishes, they somehow pile up faster than I can keep up. But first I need to get lunch for me and the boys, then get Toddler down for a nap, and if I'm lucky I can get Baby to nap at the same time so I can lay down a bit. Had a crazy day. Went running this morning, and we did pretty good. Only had to stop once at the start to calm down kids, and then halfway through the last 5 minutes to walk a bit before finishing. Then I had to go to the bank and the store. Then I spent some time trying to find a doctor who could see me today about my throat. I finally found one, Little Baby's mom came to pick him up early, and Michelle came over to watch my boys. So I went to the doctor, who was really nice, and we did a strep test. It came back negative, but he said my symptoms looked like strep and if someone has had it for a few weeks then sometimes the test will be negative, so I'm on antibiotics for it and hopefully will be feeling better in a few days. I won't be watching Little Baby for 2 days, just in case, so I might be able to get a bit more rest too. Then we had swim class, which Toddler enjoyed. Hubby and Baby joined us to swim after, that was fun. Now I need a shower and to get the boys to bed, then I might go to bed early. Susan and Janice at 5 Minutes for Mom- They run a fabulous blog that supports work-at-home moms and are always doing great giveaways. Laura (Organizing Junkie) and Lara (Lazy Organizer)- I love learning more about getting organized and these 2 give great tips and support. Kendra of VBAC Adventure- I love reading the information she has learned in her journey to have a VBAC. She's due in 1.5wks with her baby :D Good luck! Go ahead and give this award to all the Rockin' Girl Bloggers you know! Before the room was light. And wished it was still night. I greeted, too, God’s Son. In her worn Elmo gown. That a mothers touch affords. But so too the Lord of Lords. and opened jars of peas. When she grinned and said "PLEEEAAASSSEE"
I was feeding Jesus Christ. and played puzzles on the floor. and played with them some more. making memories to be stored. I spent time with the Lord. and washed the dishes clean. and folded it like new. I cleaned for my Savior too. That I'd keep them safe from harm. I comforted the I AM. I put them in the bath. As they kicked around and splashed. And put their jammies on. I washed the Holy One. Made beds and taught and played. And that we often prayed. I made a home from ordinary things. I served the King of Kings. But to two, I have done the world. I thought this was an awesome poem. I found it on a messageboard I visit. So often I get bored with doing the same daily things over and over again, or frustrated with my kids over little things. I need to remember that even the little things I do for my family are done for the Lord. I know it's not much, but this is my tiny little garden this year. 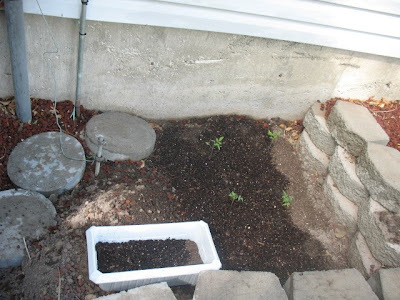 Today I finally transplanted my little tomato plant seedlings. I started out with 18 seeds, and through elimination by Toddler, Hubby, and the dang cats I ended up with 4. Yep, 4 little seedlings. And hopefully they all don't die of transplant shock. 4 is actually perfect for the tiny garden area I have right now, it would be hard to fit more. And in the little planter I decided to plant a few onion seeds, just for fun. Hopefully next year we will have the backyard done to the point where I can have a bigger garden area, but for this year my tiny little spot will have to do. So, I'm still not doing well keeping up with my goals. I'm going to work harder on some of my beginning ones that I let slip, like Toddlers bedtime routine, laundry, dishes, and my bedtime routine stuff. Monkey Kisses hosts this fun weekly Family Fridays, where you talk about something your family likes to do together. Check out Monkey Kisses for more Family Fridays ideas. So I need to write down what I need done today, or it won't get done! We aren't going anywhere at all today, no swim class today either. I first need to go shut all the windows before it gets warm. Then I need to put in a load of laundry, I finally got the pile in my room folded yesterday. I really should get the bathrooms clean today too, I keep putting them off. Maybe Hubby will help me when he gets home. I also need to thin k of what to make for dinner. Actually I think I know what I'll make, just need to remember to get some frozen chicken out to defrost. Have a wonderful weekend everyone! Name a funny habit you have. If you could instantly know how to play a musical instrument, which one would you pick? When was the last time you forgave someone, and who was it? What is your favorite kitchen appliance? 5 Minutes for Mom is outdoing itself once again with an awesome 4th of July Giveaway. From now until July 4th they will be holding lots of fun giveaways. 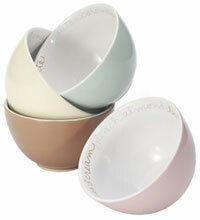 This first contest is for a very cool Krups homemade ice cream maker and set of 4 Roseanna Sweet Dreams Bowls from splendidlife.com. I would love to win this! I love ice cream and have been wanting my own ice cream maker for so long. So if you want to enter for this great prize, go to 5M4M now and check it out! I'm just counting down the hours until swim class. It's still 84* inside and I really want to jump in that pool of cold water. We haven't done much today, just sitting around trying to keep the kids happy. Dinner's in the oven, I need to switch out the laundry, I did some dishes but need to do more. That about sums up my day. Anyone doing anything exciting? It's supposed to get in the 90's again today. Right now it 74*, so not too hot yet, but it's still 81* in the house. I'm guessing in about an hour I'll need to turn the window a/c on. It doesn't really do much to cool down the whole house, but it helps, at least our bedroom stays nice and cool. I'm sitting here eating Oreo ice cream, glad that I have nowhere to go today in the heat. Well, except swim class tonight, but we'll be glad to go there and get in the nice cool pool for a bit. What's the weather like where you are? What are you doing to stay cool? Michelle (Life is Just Ducky)- My awesome friend, who is funny and sweet and always helping me out. Antique Mommy- She is an awesome storyteller and I love reading about her and her little boy. Mist (To Do...)- She is hilarious. She does whatever she feels like and doesn't care what others think. And so many of you I didn't mention that also rock! Go ahead and tag girl bloggers that you think rock! I feel like I'm melting here! It's 90* outside and 81* inside. And it's only the start of summer! I know it's just going to get worse. I wish we had more than one window a/c. I think all houses should be built with a/c included. I'm glad we get to go to swim class in a few hours and cool off. What do you do to beat the summer heat? We went running today after story time and I had to stop halfway through. It felt like a knife was in my ribs and I couldn't breathe. I'm sure it was partly because of the heat. Hopefully when we run Saturday morning it will be a little easier. Now I just want to take a nap. But we are going to do a craft at Michelle's house with the kids, that'll be fun :) Guess I'll just have to eat a lot of sugar to keep me going until bedtime. I have no linen closet, this drives me insane but I've learned to live with it. I have a few shelves in the bathroom for towels, but no place to store blankets, pillows, and other bedding stuff. So for a while all my blankets where just folded and stacked in my office closet, where they would fall over about 35 times a day so I'd need to re-fold and re-stack. I also have a bazillion pillows in there, for some reason we were re-gifted nearly 65 (*number may be a little exaggerated*) pillows for our wedding, I know because they still had previous people's names or receipts still with them. If you're going to re-gift, at least make sure you remove the original cards! Anyway, back to my blanket/pillow storage dilemma. I read a past WFMW where someone mentioned they store sheets by folding them and placing them inside the pillowcase that matches. What a great idea! I immediately started doing that. Then one day I was re-folding/re-stacking the blankets during my big closet overhaul, and suddenly had a brilliant thought! I grabbed a few extra pillowcases, folded the blankets, and amazingly they fit inside the pillowcases perfectly! That big down comforter that took up so much space and never folded right? In a pillowcase! That slippery, silky bedspread that would not stay folded no matter what? Also in a pillowcase! And so all the blankets were neatly tucked away in pillowcases and stacked nicely on top of each other (and the many pillows). Now I have an organized stack of pillows and blankets, though still in the office closet they now take up much less room. Now if I could only get Toddler to stop climbing the pile, that would help! 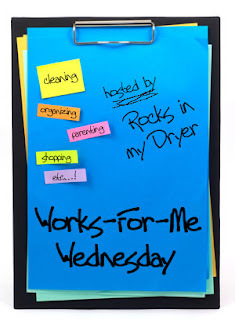 Check out Shannon at Rocks In My Dryer for more great WFMW tips! This post originally published 1/17/07. I'm just too tired to come up with something new this week. So I haven't done much from my to-do list yet. Did some laundry, since I need to wash my swimsuit for class tonight. But that's about it besides taking care of the boys. No cleaning, dishes still piled in the sink, and the bathrooms are just as dirty as ever. And definitely no nap :( Little Baby is sleeping but my two aren't. And it's geting hot, time to turn the window a/c unit on. So last night's first Mommy and Me swimming class went pretty well. Toddler had a good time. The water was a bit cold so he was shivering the whole time and was happy to get out when we were done, but he still enjoyed it. Kept saying it was fun and calling it a "big baf!" lol. We're excited to go back. Hubby tried to get some pics, but they kicked all the non-swimmers out, so he didn't get many good ones. My house is a mess and I'm getting behind on laundry so I really need to clean today and get some laundry done and put away. And it's past time for the bathrooms to be cleaned so I'll try to get those done today too. I hope the boys will all be good today so I can get stuff done. Today I signed Toddler and I up for a Mommy/Child swim class that will be 4 nights a week for the next 2 weeks. We are doing it with Michelle and her toddler. I'm really excited. I love swimming and Toddler loves the water so hopefully he will like swimming too. Dang I just realized I need to shave my legs now :P Plus they are so white. Oh well, they will be hidden in the water lol. Has anyone else done swimming lessons with a toddler? How did they like it? Monday mornings are a bit busy here. Michelle and I go running and let the kids play. Then we go to the park for lunch. So I'm usually gone most of the morning. It's nice to get outside and do stuff, and it helps the kids burn energy and nap good when we get done. My knee is starting to feel better too, so running isn't so hard. Now I just need to get the boys to sleep and feed Little Baby then I can relax a bit. Happy Father's Day to all you daddies out there! Today was a good day. 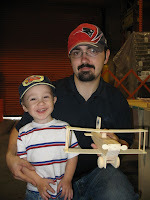 I gave Hubby Season 7 of Seinfield, a nice card, and a few cards the boys made at storytime. Then after church we had a bbq with the inlaws and that was fun. Now my 3 guys are all asleep on the couch, and I really should get to bed myself. I'm exhausted even though I got a nap while MIL did my dishes (aren't I lucky?). I love seeing Hubby as a daddy. With each of my boys I remember seeing him hold his little babies for the first time with such a wondrous look in his eyes, and it made me fall more in love with him in that instant. He's always been so good with them and such a help to me. He never hesitated to change diapers (in fact, he changed both boys before me, I didn't even have to change either one for the first 3-4 days), he helps get them to bed. Most nights he gets Baby to sleep, even getting up in the middle of the night to get him milk sometimes. Toddler adores spending time with him and always wants to "go hep Daddy" in the yard. I am so grateful for him. I love you Honey! Happy Father's Day! "Learn to see in another's calamity the ills which you should avoid." This seems like pretty good advice to me. Instead of having to learn from your own mistakes all the time, you can watch others and learn from theirs. You'd think that would be easy advice to take, but it must not be since many times we all seem to make the same mistakes lol. Maybe from pride or thinking we can do something better. It would just be much easier not to learn from someone else and not have to make that mistake. I'm still not doing too good at keeping up with my habits. I'm seem to go through spurts of doing really good and doing really horrible. I think part of it is the heat, now that it's so warm I just don't feel like doing anything. I'm doing really good at my newest goal of getting dishes to the kitchen instead of laying around the house, not perfect but much better. Doing awesome at prayers, scriptures, and computer time. Doing pretty bad with all my bedtime stuff, haven't even flossed once this week. I've barely been getting dishes done and getting behind in laundry. So no new goals this week, I'm going to keep working on what I have. The point is to list 7 random things about you, I think stuff you haven't mentioned on your blog before, then tag 7 people. 1- I love having kids; being pg, giving birth, the whole thing, just LOVE it :D I want lots of kids and am just waiting on Hubby to be ready to have another now. 2- My whole life growing up I wanted to be a teacher. Once I got to college I changed my mind because I remembered I hate being a leader and talking in front of people lol. 3- My favorite game show is Wheel of Fortune, but I hardly ever get to see it because Toddler pretty much controls what we watch. 4- I had a miscarriage between my two boys. It's not something I'd wish on my worst enemy. 5- I don't like steak or shrimp. Yes, I know I'm weird. 6- I rarely wear makeup. With my psoriasis, foundation and blush just make me look splotchy. And I have sensitive eyes so mascara and eyeshadow make them water. Sometimes I put on a little lipgloss or lipstick, but not very often anymore. I only wear makeup on special occasions like our wedding day. 7- I love to organize, but I hate to clean. No, they are not the same thing! I'm not tagging anyone because everyone I know has already done this at least once lol. - I love that my house is at the end of a cul-de-sac. We don't get much traffic or strangers, so it feels safer for the kids. And it's quiet. Create a new name for a deodorant (like “Flower Fresh” or “Shower Scent”). - Um, I can't think of any that don't sound completely stupid lol. What was the last piece of software you installed onto your computer? - An add-on for Firefox to auto-refresh pages. If you were to receive a superlative award today beginning with the words ”Most likely to…”, what would the rest of the phrase say? - Most likely to procrastinate. What two colors do you like to wear together? - Probably black and white, but really I don't care I usually wear jeans and any color t-shirt. Once again, 5 Minutes for Mom is doing an awesome contest. If you have a baby, are expecting, or want one for a friend's baby you should sign up for the contest to win one of 2 giftbaskets with items from PLAYSKOOL and CVS/pharmacy. 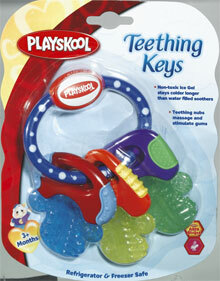 These giftbaskets include baby care products such as diapers, wipes, teethers, sippy, and more. So if you want to get in on this awesome contest go sign up at 5M4M. I know I would love to win it. And keep checking back at 5M4M because they are always doing great contests. OK, I see you all out their lurking and not leaving comments! I have had zero comments today, and only one yesterday, though I get around 50 visitors a day. I know it's kinda shallow and all, but I live for comments. I like knowing someone out there cares even a tiny bit for what I'm saying. It doesn't even have to be a long comment, a simple "LOL" "I understand" or "Have a great day" would work for me, I'm not picky. And I promise I will try to do better at commenting back to you. So show some bloggy love? Well, since we put off getting our cats (2 female, 1 male) fixed, it is quite possible that in a few months we will be having at least one litter of kittens. The problem is we cannot afford more cats, and I definitely do not want to deal with them. So if/when they have kittens I only want them as long as they need to be with their mothers, but hope to find people to take them. How old do kittens need to be before they can be separated from their mom? And what's the best way to advertise free kittens? You can bet after this we will be getting the cats (or at least the male) fixed lol. I love taking the boys to story time. They really don't get much time around other kids, so it's nice to get them out socializing a bit. Toddler really loves it, especially cuz we go with Michelle and her girls. We have 2 libraries here to choose from. We are heading to story time right now at the one I like better, the lady who does it is just so nice. So, it's not much, but story time works for us! Find more great WFMW tips at Rocks In My Dryer. Lorie tagged me for this meme. You are supposed to list your quirky personality traits. This is a little hard but I'll try to think up a few. 2) I hate to drive. Whenever I can, I have Hubby drive, especially on long trips. I'm so used to him driving that if I'm driving I can actually forget I'm driving, then suddenly think "Oh, I better pay attention, I'm driving!" 3) I used to have to have clothes (even Hubby's) hung up by color and type, but have loosened that a bit so now they are just hung by type. Mixed up clothes just get my nerves on end. 4) I like to eat one section of food at a time, like veggies, then potatoes, then meat. I finish one part before going to the next. Not always, but when I don't it just feels weird lol. K, that's all I can think of for now and Toddler is screaming at me so I can't think of anyone to tag, so go ahead and do this if you want! * Take a nap- yeah right! Well, Toddler and Little Baby are sleeping, and Baby is watching a show, so I guess I'll go clean something. Maybe. I'm so excited! I'm on the Top Momma front page right now! Click this button to see how long I can stay there! If you haven't checked out Top Momma, go see what it's about. It's a fun little contest to see how long you can stay on the front page. 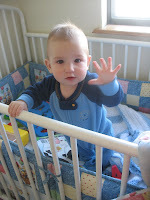 My pic is a cute one of my Baby in his crib. Isn't he adorable? So check it out and help me stay at the top! I'm really excited about this contest. Adventures in Babywearing is having a giveaway of a $75 gift certificate to MamaKanga, a great place that sales all kinds of slings, wraps, carriers, and diaper bags and accessories. I would love to be able to buy a Mei Tai carrier, I've heard so many wonderful things about them. They have an amazing blue asian BabyHawk mei tai (picture to the left) that I would love! Plus, MamaKanga offers FREE shipping on all orders over $35. You have got to check that site out, it looks great! Man my house is a mess! Toddler decided to mix the dirty clothes in the hamper with the clean clothes in baskets by my bed :P Now I need to try to sort them out so I don't have to wash them all again. We went running this morning. My knee is still hurting me, but it's getting a little better every day. Later I need to go to the library, I have books and movies due today and a book on hold to pick up. Wait, I forgot I canceled that hold because someone was supposed to lend me the book but forgot, dang it :P Well, maybe it'll be checked in anyway. Better go, Little Baby is crying. 5 Minutes for Mom is doing a Father's Day giveaway. 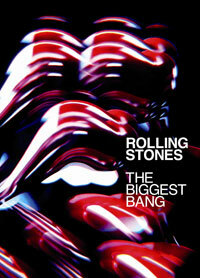 The first giveaway is a Rolling Stones boxed set, with music, concerts, documentaries, and behind the scenes of their latest tour. The second giveaway is for a cool Rocketfish™ Twister Wireless Laser Notebook Mouse, perfect for use with laptops, easy to carry, and an ergonomic design for comfort. So go check it out and you could win a cool gift for the Dad in your life. 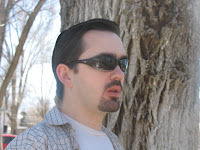 This is Kara's husband, or Hubby as I am known on her blog, talking to you again. As many of you may know, I had that accident about 4 months ago where I lost a part of my thumb. I still have this scar where there was extra space and scar tissue filled in. It really bugs me from day to day especially when I think of how dumb it was for me to do what I did. Anyway, I was wondering if anyone knew of some good stuff I could place on that scar to soften it up. It is a lot harder then normal tissue and it doesn't help that it is. Any suggestions would be greatly appreciated. This week I did not do well. I started out good, but got really really bad. For example, out of my 15 or so goals, Friday I did only 3. Yeah, that bad. The only goal I'm doing every day is reading my scriptures, thanks to getting it sent to me in an email every day. Surprisingly out of the ones I am doing better at, I'm getting to bed by 11:30 most nights. Only missed that Tuesday because I didn't get home from out of town until after 11. The rest of my goals flew out the window and I was too tired to go catch them and bring them back lol. But I am going to do better! I am going to work harder at them all this week, I promise! This is my first time joining in Family Fridays, hosted by Monkey Kisses, who I found through Lorie. Every Friday you post an activity you like to do with your family. 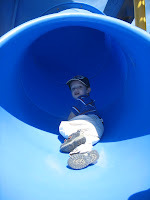 What we love doing in the summer is taking the boys to the park. During the week we can get free sack lunches at the park, so I go with Michelle and her family and we eat lunch and let the kids play. This is great because not only do we not have to make lunch, but the kids really love playing at the park, so they have fun and then get worn out for naptime. The fresh air is nice for all of us and helps me to get away from the computer and out of the house once in a while. Today is much better than yesterday. The boys are behaving better, though Little Baby has been a bit fussy this afternoon. I haven't had to clean poop off the floor (always a plus). The house is it's usual disaster, but I have the whole weekend ahead to clean. I just need to figure out something for dinner. Or we can just have leftover pizza. What do you consider to be the ultimate snack food? - Hm, probably Peanut M&Ms. If I have some I just cannot stop eating them, plus I like them anytime. On a scale of 1 to 10 (with 10 as highest), about how popular is your last name? - Well, I don't know, maybe a 2-3 overall? In ID I'd say about a 7-8 lol, everyone's always asking if I'm related to so-and-so. Who is your all-time favorite sitcom character, and why? - Tough one. I really love Friends and Seinfeld, but can't pick a favorite, they are all good. Do you shop online? If so, name some sites you like to browse for goodies. - I don't usually shop online, when I do it's usually at Ebay. - I think Paris Hilton should be sent back to prison. Can I just crawl back in bed and sleep the rest of the day away? Then wake up to a spotless house, angelic Toddler, smiling Baby, breakfast in bed, and a good book to read in the tub? Yeah, probably not. Toddler sure is on one this week. He's had more timeouts, sendings to his room, spanks, and talking-to's in the last few days then he normally gets in a month. I think he's been storing up his naughtiness to use on me on a day that Baby is cranky from shots, Little Baby won't eat or sleep much, and I can barely get around cuz my knee hurts. Today I've had to deal with him peeing on the floor repeatedly, helping Baby get his first fall down the stairs (he's fine thankfully), coloring with permanent marker on himself and Baby and the table and coffee table, woke the babies from naps early, and made a ton of messes. I can't ake any more terrible twos! Someone please tell me 3 is better! Now Toddler is napping, but the 2 babies are screaming so I keep going back and forth consoling them. Ugh, I neep a nap! In honor of getting our satellite turned back on last week, this post is about DVR, Digital Video Recording, like Tivo. I love being able to record shows I only like a litte, so that I will never have time to actually sit and watch them anyway, but knowing they are there if I ever do want to watch them is comforting. It's like having that can of refried beans that sits in the cupboard for years. Nobody wants to eat it but it's nice to have it there in case all other food on Earth is eaten and there's not even grass to chew on, then you will pull it out. We don't get to go out to movies or rent movies very often because we can't afford to, so I've missed out on some good movies. Well, if I win one of 5 Free 6-month Netflix subscriptions from 5 Minutes for Mom, I can get caught up! That's right, they are giving away 5 6-month subscriptions for Netflix, so go over there now and enter! I've wanted to try out Netflix, sounds really cool. Does anyone have this or similar rental subscriptions? What do you think of them? Are they worth it and how is their service? Inquiring minds want to know! Today's WFMW has a theme on what to do when your kids are bored. Since my kids aren't really old enough to complain about being bored yet, I was stumped. Toddler occupies himself pretty well by making messes, watching cartoons, or coloring. And Baby just follows us around and wants to be held a lot. So no real complaints of boredom yet. So my little tip is one I'm sure you've all heard before. I know my parents used it a lot! When a kid comes up and says they are bored and can't think of anything to do, mention that you can think of many things they can do and start listing off chores. Guaranteed they will say "Nevermind, I'm not bored!" and find something else to do pretty fast! Since I was the oldest girl in a large family I was usually in charge of taking care of the kids and a few things I did when the younger kids were restless were have coloring contests and cleanup races. For the coloring contest we would all get a coloring book page and color, then everyone would get a prize for fastest colorer, stayed inside the lines best, most colors used, etc. And for the cleanup races we'd set the timer for 5 mins, give each of us a room to work on, and see who got the most done in that time (this was especially good for me when I was babysitting and the parents were due home any minute and the house was a mess lol). It's amazing how much kids will clean up if you make it sound fun and like a contest. For more boredom busters and WFMW tips check out Shannon at Rocks In My Dryer. You know that saying "There's no such thing as a free lunch"? Well, they were wrong! LOL I don't know if this is common all over but our city does free lunches at the parks during the summer for kids. They get milk, juice, fruit, chips, and sandwich. This is awesome when I don't feel like making lunch lol. It costs $3 for an adult to get one, but I just get 2 for my kids and eat whatever they don't. We went today with Michelle's family and let the kids play for a bit after. It's also a great way to get kids all worn out for naptime. By the time I got home all 3 boys were sound asleep in their carseats. Free lunch and sleeping kids, is there anything better? Michelle and I are doing really well on our Couch-to-5k practices. This week we run 90 seconds, walk 2 minutes, for 20 minutes. We did that about 1/2 the time yesterday, then started running 60 seconds, walking 2 minutes, cuz it was hot and we were getting tired. But Thursday should go great, it'll be nice and cool out. It's so nice having someone to run with, keeps me going. * Go to my little sister's high school graduation, I'm so proud of her! Should be a great day!Get to spend time with my family, and the boys will have fun too. The only un-fun part will be driving home. I hate driving, especially 3 hrs! Just thought I'df share a few cute pictures from this last week. I may be biased, but aren't my boys just adorable?! And they love getting their picture taken too. Toddler is being so cute lately, giving hugs and kisses, and asking for them in return. This morning as Hubby was leaving for work I overheard them having a conversation. Toddler asked his daddy for hugs and kisses, then said "Give Mommy kisses and hugs?". Yesterday he came up to me and I asked him for a kiss which he kindly gave and then said "hugs?" so I complied. This is so much better than having to chase him down and tackle him to get any affection lol. Good morning everyone! Hope your week is off to a good start. Today will mostly be a normal day I think. I might go running today instead of tomorrow, because tonight I'm headed down to my family's house (3hr drive) for my little sisters graduation tomorrow. So tomorrow I don't think I'll be on much. I'm so proud of my little sister, she has worked hard to get good grades in high school, all while going to beauty school too. By the end of summer I think she will already have an associates degree and cosmetology license. I wish I could afford to get her a graduation gift, but I can barely afford to drive down there, so hopefully my presence will be gift enough. I need to go to the library and bank today and get milk too. I better call Michelle to see if she wanted to go running today or not. OK, not really, but it is hot! I'm not a fan of weather that's above 75* (or below 60* lol) and right now it's 88* here. We don't have air conditioning so our house is always so hot in the summer. Guess it's about time to get out the window a/c unit, that will at least keep the upstairs a little cooler. Tomorrow's supposed to be just as hot, but luckily it'll be a little cooler the rest of the week, even around 60* on Wednesday and Thursday. That'll be nice for out Thursday run. I know it could be worse, I'm glad I don't live in Phoenix or Las Vegas or something. What temperature are you most comfortable at? Do you prefer Winter, Spring, Summer, or Fall? Well, we kind of slacked off a bit this week with the potty training. Whenever we go out we put a diaper on Toddler, and if it's on too much he stops wanting to use the potty. So I'm trying to do more bare-bottom time to get him back to using his potty. But now I think he's holding it in, cuz he has no diaper, hasn't used his potty, and isn't going on the floor. He's gone in his underwear once today, but other than that he's not doing anything. Silly boy. OK, so it's not Saturday, I'm a little late :) Yesterday was Baby's birthday party, plus our cable line accidentally got cut by a neighbor so we didn't have Internet most of the day. I did good with my goals most of the week, but absolutely teerrible on Thursday and Friday, like really really bad. I'm having a hard time remembering my morning prayers (speaking of which, I'll be right back...) but still reading my scriptures every day, and getting better at doing Toddler's bedtime routine. Besides those 2 days off, I did pretty good with most of my goals this week. Since I need to work on re-establishing what I let go this last week, I'm just going to add an easy goal to work on. I'm going to work on not leaving dishes lying around the house. Whenever I do dishes I have to wander the house picking up sippy cups, cereal bowls, etc so I want to be able to stop that. Whenever I leave a room and head in the direction of the kitchen I will see if there are any dishes I need to take with me. Right now my cereal bowl is on the desk here, so next time I head downstairs it's coming with me. Check out the Lazy Organizer to join in SHS! I can't believe my little Baby was born 1 year ago, how did the time pass so quickly?! This year has sped by in a blur of laughs, milestones, and sleepless nights. Baby is changing so fast! He walks everywhere now, has 7 teeth, loves giving slobbery kisses, and I'm pretty sure his first word is "pat-a-cake". He loves playing pat-a-cake and likes Elmo. He always wants to help or play with whatever we are doing. Toddler loves to play with him though he also pushes him when they don't want to share toys. Baby really likes buttons, he loves pushing the button on the computer to make the cd drive go in and out, and he learned which button on the vcr to push to make the video come out so he pushes that, pushes the tape back in and repeats. He's so funny. And he's such a momma's boy. He prefers me almost anytime over everybody else and wants me to hold him a lot. He's a bit jealous of the baby I babysit, and has wanted to be held more since I've started that. It's funny how he and Toddler are so alike, yet so different. They look similar but have different personalities. And Baby is a light-weight like Toddler too, at only about 19lbs right now. That's ok, I love my little boys just the way they are. 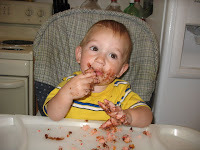 We are having his birthday party tomorrow, just a little one like we always do. Good thing he doesn't care what he gets because we plan to just get him some sandals and maybe some clothes, he doesn't need anymore toys! OK, so after my appt Wed I had some random cntrx but didn't think anything was going to happen that soon. Well around 9:30pm they started getting a bit more painful and somewhat regular. I still didn't want to get up my hopes cuz I was scared they would just go away. Around 12:30am they were getting consistently about 3 mins apart so I started letting myself believe this would be it. I couldn't sleep because of the cntrx so I stayed up all night cleaning up and making sure everything was packed and ready to go to the hospital. Around 7am they slowed down, but after an hour they picked up again. I labored at home as they got stronger. They were around 3-5 mins apart. I was having to concentrate through them, but didn't want to head to the hospital yet. Around 9:30 we called our families to let them know the baby was coming that day and my mom started on her way up. I continued to labor at home until my mom and sisters showed up around noon. We left for the hospital and had to wait 1/2hr for a room to be cleared for us. So around 12:30 we get settled in and they check me. I was already 7+ cm and fully effaced! That made me feel so much better that all those cntrx had gotten me that far already. The dr asked if I wanted her to break my water, but I said I'd like to wait just a little longer and see if it broke on it's own. After this point I don't know exact times cuz I was having lots of pain from the cntrx. I tried changing positions and walking but it was getting hard no matter what I did. Probably around 3:30 they checked me again and I hadn't made much progress but the bag of waters was really bulging. I was in a lot of pain and told them to go ahead and break my water. Things continued to get more and more painful and I was moaning through the cntrx while squeezing my moms hand and Nate was putting pressure on my back. I got a little snippy with Nate a few times and told him to shut up once lol. But he was being great and they were telling me how good I was doing. (I had my mom, sis, sil and Nate with me). My nurse was very wonderful. I think around 4:30 she checked me and told me there was just a little cervix and had my try to push the baby's head past it. I was in so much pain that they had to help me with my breathing and I was starting to get pretty load and yelling. ( I later was told that a nurse came in and said I was scaring the 17yr old laboring down the hall lol) I was able to get baby's head moved down a bit and past the cervix so they started setting up the room. I wasn't paying attention to much going on around me because I was hurting so bad and the cntrx were only giving me a few breaths in between them. I started pushing I think around 4:45 and then suddenly they were telling me to get on my side and were putting oxygen on me because baby's heartrate was staying around the 90s and not going back up. Every time they asked me to do anything I was shaking my head or saying no or I can't do it, but I had to anyway lol. I pushed for a while on my side until they got the bed all ready and then I was on my back holding my legs and they told me I needed to get the baby out quick. Everything seemed to be so blurry to me from all the pain but I knew I needed to push as hard as I could. I did not want to have another c/s so I pushed harder than I thought I could and slowly I could see more and more of his head. Finally I gave a huge push and his head came out. His shoulders were stuck because he had one hand up by his shoulder, but my wonderful OB was able to pull out his arm and had me push one more time and out came his shoulders and one more small push and he slipped out. They laid him on my chest and I was able to touch him. I think my first words when he came out where "Oh my gosh!" and "I did it!" Nate cut his cord and they had to quickly take him to the warmer to get his oxygen because he was having a little trouble, but he pinked up quickly. They wiped him down a bit and then weighed and measured him, 8lbs 14oz and 20in long, only an ounce smaller than Toddler had been. He was born at 5:15 pm. They stitched me up and stuff and then they brought him back to me and I got to hold him and I was so happy to have my beautiful little boy. I kept telling everyone "I did it!" I let some of my family members hold him a bit. Then I got to breastfeed him for the first time. It took him a few minutes to get latched on but then he got it and I nursed about 15 mins, and then let family hold him some more while dr finished sewing me up. After that they took him to the nursery with Nate and bathed him and all the newborn stuff. I was taken to my postpartum room and had dinner and was able to get a little rest until about 8 when they brought him back. I nursed again and more family visited and then finally we were alone. The first night went well. I didn't sleep much but Baby slept a lot. 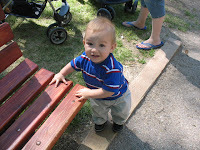 We were discharged just one day after he was born. I was so happy to be able to be home so soon with my baby! I can't believe I had an all natural VBAC! I'm so sore and tired but I'm so proud of myself. On a scale of 1 to 10 (with 10 highest), how stressed are you today? - 4, don't have much to do today, but the house is a mess so I should clean, and today is Baby's 1st birthday so I need to get ready for his party tomorrow. What kind of cleanser do you use to wash your face? When was the last time it rained where you live?